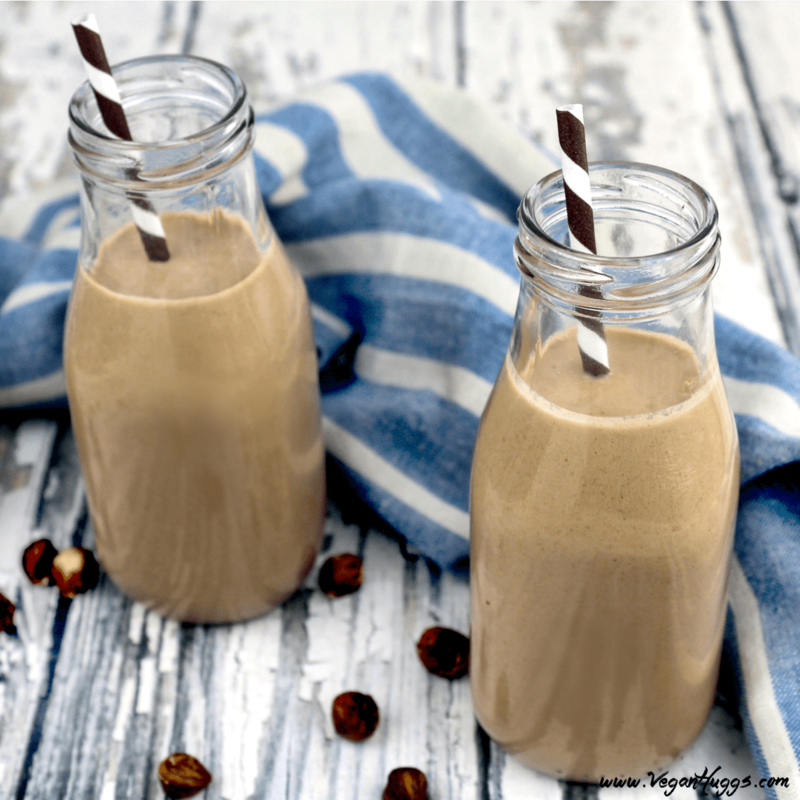 This homemade Chocolate Hazelnut Milk is rich, creamy and nutritious. 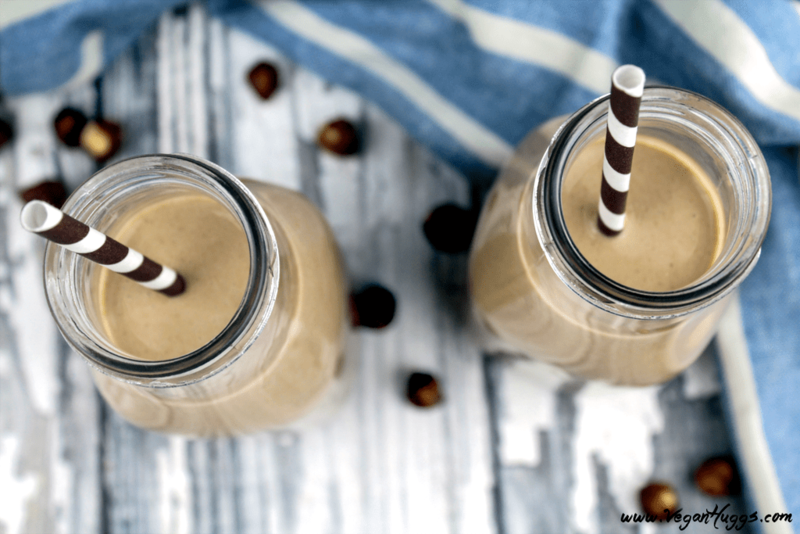 It’s reminiscent of Nutella milk, but much healthier. I absolutely love making homemade nut milk, because it’s so easy to prepare and worlds healthier than store-bought varieties. I make almond & cashew milk a lot, but every once in a while, I break out the hazelnuts and I make Chocolate Hazelnut Milk. It’s chocolate-y, subtly sweet and decadent. It’s seriously like liquid Nutella, but without all the junk. This dreamy delight is so easy and takes about 10 minutes to make. However, there is some waiting time involved while the hazelnuts are soaking their way to goodness. It’s not fun to wait, but I promise the results will be so worth it. The soak time takes about 16-24 hours. I feel like the longer they soak, the smoother the milk is. Also, it will unlock enzymes & nutrients to make the nuts more digestible & super healthy. Hazelnuts are a great source of protein, heart-healthy fats, calcium, magnesium, phosphorous, potassium, vitamin B, vitamin E, zinc, copper, iron, manganese and selenium. This is completely raw recipe, so you will get all that nutrition in one serving. For the chocolate flavor, I used raw cacao powder, which is a great source of iron, magnesium, zinc, omega-6 and it’s loaded with antioxidants. For the sweetness, I used medjool dates, which also adds a rich texture and subtle hint of caramel-like flavor. They are truly nature’s candy. Besides their deliciousness, dates are rich in fiber, iron, potassium, calcium, manganese, copper, and magnesium. Wow, this chocolate hazelnut milk REALLY does a body good! You won’t need anything fancy to make this heavenly treat…you’ll just need a good blender, a nut milk bag or a fine mesh strainer, and some patience. 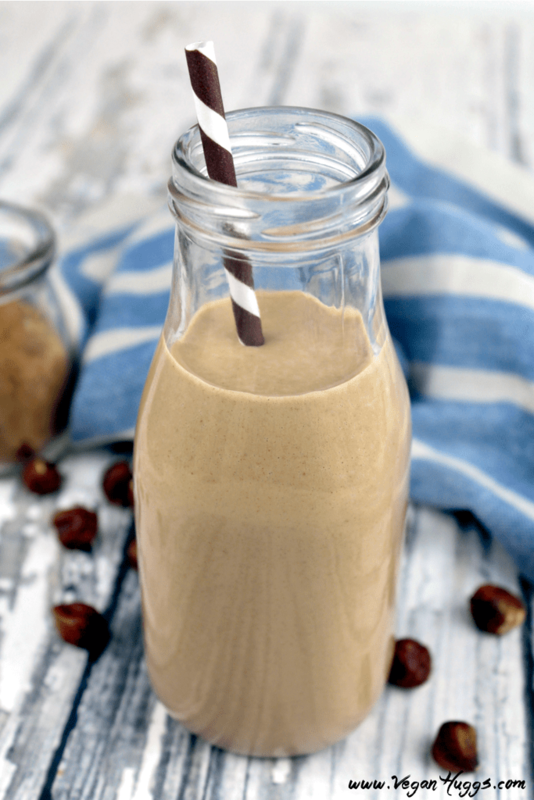 This Chocolate Hazelnut Milk goes great with cookies or enjoyed by itself. You can also use it for smoothies, ice cream, desserts or for a delicious coffee creamer. Hazelnut and coffee are what dreams are made of, so go for it. If you’d like something a little more toasty for the fall atmosphere, just heat this creamy milk up, put on your fuzzy socks and enjoy the goodness. Don’t forget the vegan whipped cream! 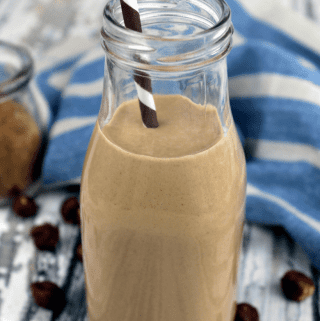 This vegan Chocolate Hazelnut Milk is rich, creamy and nutritious. It tastes like Nutella, but is much healthier. It's gluten-free, dairy-free & delicious! Add filtered water and hazelnuts to a blender and pulverize for 2-3 minutes. Pour mixture in a nut milk bag, over a big bowl. Squeeze firmly, until most of the liquid is released. Rinse blender out and pour strained milk back in the blender. Add the cacao powder, vanilla extract, salt, dates and cinnamon. Blend until creamy and smooth and date particles aren't floating around. Taste for sweetness and adjust as needed. The soaking time can be cut down to 10-12 hours. I prefer to soak longer though, to have super smooth milk. Also, I leave the hazelnuts soaking at room temperature for 6-8 hours, before placing in the fridge. This helps them breakdown a little easier. *Prep time doesn't include the soaking time for the hazelnuts. *I prefer this drink to be sweet to balance out the cacao, which is somewhat bitter by itself. Feel free to add less dates, if you like it less sweet. *The hazelnut pulp can be used for a variety of recipes, so you can store it in the freezer for a later date. Recipes coming soon. 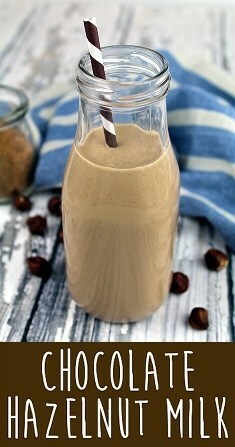 If you make this Chocolate Hazelnut Milk, or one of my other recipes, I’d love to hear from you. Leave a comment below and let me know what you think. It would really make my day. You can also follow me on Instagram and share your creation with me, Just tag me @veganhuggs and hashtag #veganhuggs. Hi there, can I use lightly toasted hazelnuts for this, there are no raw available where we live? 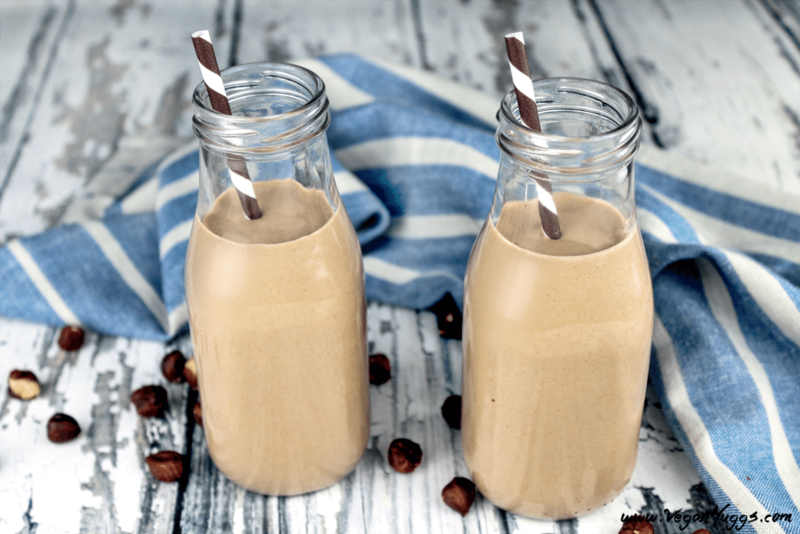 I love your chocolate hazelnut milk recipe! This is definitely a keeper! !